​Dimplex’s new electric Bathroom Panel Heater combines a three-in-one design, perfect for smaller bathroom spaces, providing space heating, towel airing capabilities and mirrored or modern metal facia - along wit a Lot 20 compliance for added peace of mind. This stylish, splash-proof bathroom heater combines high-convection heat, together with an aluminium rail for drying and airing towels. 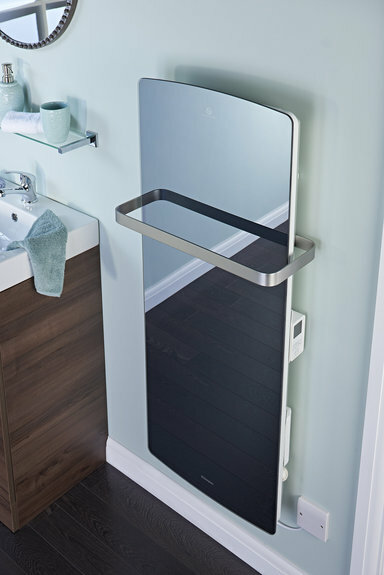 The combination of functionality and contemporary design results in a compact, three-in-one solution without having to compromise on individual space heating or towel airing appliances. Economical and efficient with a heat output of 1kW, the Dimplex Bathroom Panel Heater is a much more effective space heating appliance compared to a towel rail or warmer, with a typical output of only 50-150W. The Dimplex Bathroom Panel Heater not only delivers the warmth home owners expect, but also comes with Lot 20 compliant controls, helping installers to meet the requirements of ErP Directive for local room heating products which are set to apply from January 2018. Designed with style and efficiency in mind, the new Bathroom Panel Heater is available with a modern metal facia or tinted mirror effect with de-misted capability. It also comes with a user friendly advanced control, splash-proof capsense technology and a colour changing, graphic display. For more information on the Dimplex Bathroom Panel Heater, or any of the Dimplex range of products, please contact us at salesireland@glendimplex.com.